The Transformers franchise is turning into the franchise that just keeps on giving. That doesn't mean that what it gives is particularly good, but there seems to be no stopping these films. Even when the last film wasn't particularly a masterpiece, that's still doesn't stop people getting excited about the next film and this trend appears to be continuing with Michael Bay's fourth Transformers film. Transformers: Age of Extinction is the victim of a disastrous screenplay which proves that sometimes we really don't learn from our past as it makes the same mistakes as the third film. While some of the sound editing and special effects are well done, it is gift-wrapped in the ridiculousness of the situation that it is impossible to take even the action sequences seriously, which is what Transformers is all about. It has been three years since the battle of Chicago and the Autobots have all gone into hiding after the government has ruled that all Transformers are now considered a threat. 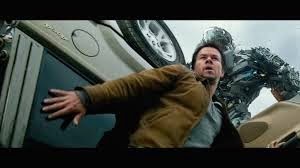 A struggling Texan inventor, Cade Yeager (Mark Wahlberg) is the one who finds the incognito and injured Optimus Prime (voiced by Peter Cullen) and restores him to health. 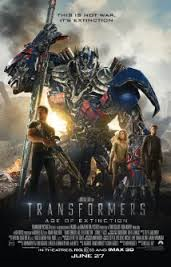 There is a huge bounty on his head which would help Cade and his teenage daughter, Tessa (Nicola Peltz) out immensely and even though Cade is hesitant about giving away the whereabouts of the head Autobot, they are soon found out and it becomes not just the Autobots who are running for their lives. Sequels are often talked about as being films which take the things that worked in the first film and exaggerating them in hope of continuing that success. So what happens when you get to the fourth film? You would think that if a franchise has got to a fourth film the screenwriters would have worked out what works and what doesn't, but if Transformers: Age of Extinction is anything to go by, this is quite clearly not always the case. The screenplay is absolutely atrocious and it's dialogue particularly dreadful. It is usually acceptable for the dialogue in an action film to be a little bit corny, but this film takes it to a whole new level. It is the type of dialogue you would expect to hear in a B grade movie. Many of the words that come out of the character's mouths are just laughable and the result of screenwriter, Ehren Kruger trying to do too many things at once. There is no way which the actors could have delivered some of these lines and not have them sound ridiculous. For example, a line like "My face is my warrant" makes very little sense and Mark Wahlberg's Cane exclaiming "I'm an inventor!" prompts you to wonder "Who really calls themselves an inventor in this age?" Time is something which Transformers: Age of Extinction has little grasp of on various levels. Firstly at two hours and 45 minutes, it is needlessly long. Much like the third film, Transformers: Dark of the Moon, there comes a point in the film which feels like a finale and if it had finished here, it would have been almost bearable. However, it drags on for another hour while the audience still remains ready for it to finish. From a production side, the film is terrible at representing time and distance. The Yeager family begin in Texas, then travel by truck/Optimus Prime to Monument Valley on the Utah/Arizona border and then in no time they are in Chicago. This whole trip would take them at least 35 hours if they drove non-stop, but seems like it happens in the blink of an eye in the film. The drive from Monument Valley to Chicago itself takes 22.5 hours at least, but this isn't represented at all. However, Transformers films have always been more about the action and special effects than the brilliant story and witty dialogue. As one could expect, the CGI used to create the Transformers is quite impressive, but there are also some scenes in which the CGI looks removed from it's live action surroundings in a way which it shouldn't. Another failing occurs when the situation is so ridiculous that the special effects seem comical. The slow motion screaming in the car is more funny rather than thrilling. With such wonderful special effects and also impressive sound editing on hand, it feels as if they are wasted by trying to support and save the screenplay. Again, with a screenplay such as this there is little hope for any good performances, not that one would be expecting any Academy Award performances in a Transformers film. While Mark Wahlberg's performance is lacking emotion (especially when his daughter has a gun to her head), he is a more convincing Transformers lead man than Shia LaBeouf. While the two characters are quite different, physically and characteristically Wahlberg gives the impression that he belongs in the film more than LaBeouf. Stanley Tucci's Joshua Joyce has one too many comical lines and starts to waver on the brink of becoming annoying. Michael Bay loves his Transformers leading ladies. First there was Megan Fox, then Rosie Huntington-Whitely and now there's Nicola Peltz. Tessa is quite a weak character and is regrettably so as she has the potential to be a strong character. Towards the beginning of the film, she points out to her father all the things she helps him with and how he couldn't get by without her, which would normally indicate that this is a strong and independent woman to be able to take on the role as woman of the house. Yet, she rarely puts up a fight during the film and is more than often the damsel in distress. This is no fault of Peltz as this is what the screenplay calls for, but with a character like this there is really no way to be able to acknowledge what type of actress Peltz actually is. There is very little chemistry between her and on screen boyfriend, Shane played by Jack Reynor, or between her and Wahlberg. Also, what girl wears incredibly high wedges to school and to walk along a long dirt road when she comes home? A Michael Bay Transformers girl, that's who. The incredibly funny thing is that when the fifth Transformers film will be released, nothing that has been said about Transformers: Age of Extinction will matter. The pull of the Transformers franchise is too strong to allow the previous film's success to detract from the excitement of future films. All we can hope is that Ehren Kruger will learn from the mistakes of this film and make up for it in the next film.